"Oh, monster's are scared," said Lettie. "That's why they're monsters." This book was very strange, but that's not necessarily a bad thing. It reminded me of a darker, more disturbing version of A Wrinkle in Time (one of my favorite books). 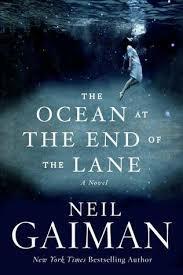 Gaiman is extraordinarily creative; numerous times I wondered how he came up with things in this story. What kind of mind must one have to write like this? I think the best way to describe this book would be as a dream-like, but bordering on nightmarish. Nothing is as it seems, and things don't follow the rules of this world. The nanny is evil, cats grow in fields, birds of prey seek to devour you, and the pond is really a deep ocean. It doesn't make sense, but, it doesn't have to. And trying to force it to make sense destroys the magic and the symbolism. Some underlying themes that stood out to me: childhood is beautiful and should be cherished, good triumphs over evil, love is the ultimate healing and preserving force in the universe, adulthood is a state of mind more than anything else, just because you can't see something or explain it doesn't mean it's not true, and life is part of a larger picture, an over-arching story that we can't fathom. "Adults follow paths. Children explore. Adults are content to walk the same way, hundreds of times, or thousands; perhaps it never occurs to adults to step off the paths, to creep beneath rhododendrons, to find the spaces between fences." "Grown-ups don't look like grown-ups on the inside either. Outside they're big and thoughtless and they always know what they're doing. Inside they look just like they always have. Like they did when they were your age. The truth is, there aren't any grown-ups. Not one in the whole wide world." "She really was pretty, for a grown-up, but when you are seven, beauty is an abstraction, not an imperative." "Memories were waiting on the edge of things, beckoning to me." "I liked myths. They weren't adult stories and they weren't children's stories. They were better than that. They just were." For a small book, this novel had some big ideas woven together in creative ways. If you like some deeper, darker themes with your fairy tales sprinkled with a bit of the absurd, this book is for you.